Total gain (realized and unrealized) is near all-time high. The highest total gain was achieved back in January 2018. Looking back, the pace of market recovery was swift as my portfolio was still in unrealized lost just 4 months ago. If nothing goes wrong, I am expecting total gain to reach all-time high next month. STI has increased by almost 10% YTD and it seems like the rally will continue in the short term. The Brexit deadline has also been postponed to Oct so there seems to be no near-term negativity. 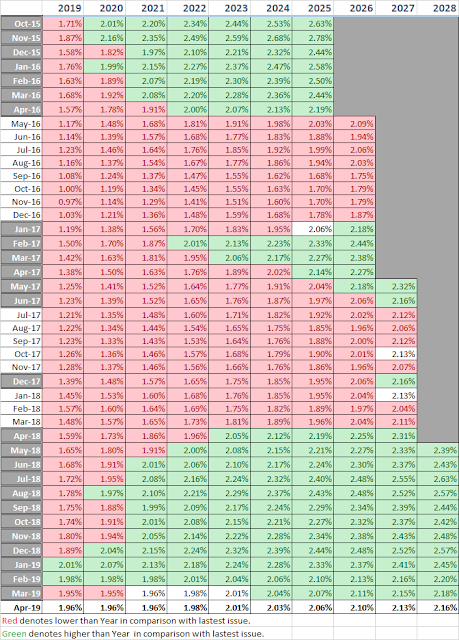 May is coming and perhaps the "Sell in May and Go Away" effect might take place with people taking profits off the table. Portfolio value is around $400k as shown in the second chart. Total cumulative return is around 27% but that is over 8 years period with capital injections. I read that your unrealized profit is $34,797, realized profit is $69,603, and total dividends received is $77,613. So total increment is $182,013. So your total pure capital injection is $217,987. Is this correct? Realized profit includes dividend. So it can be breakdown into $34k unrealized, -$8k realized, $77k dividend.